Awning windows are a traditional favourite. The elegance of the uninterrupted pane of glass is combined superbly with the sturdy frame, making the awning suitable for almost all conditions. Our company has the expertise to manufacture domestic and commercial awning windows in Melbourne to any requirement.We bring forth a qualitative range of awning windows in Melbourne. These awning windows are built to customized specifications as per the requirements of our clients. We can offer awning windows to any varied specifications, designs and dimensions.In Melbourne, awning windows are ideal to be used in both commercial and residential establishments and add a touch of elegance to the surroundings. Our range is widely acclaimed by our clients for their attractive designs and features. EuroTech Windows’s awning windows are durable, waterproof and have a designer appeal that will withstand any climatic conditions. EuroTech Windows is committed to our customers and aims to provide prompt, efficient service in any scaled project. Our qualified team can create an overall windows and doors solution tailored to your individual needs. At EuroTech Windows, you can be assured you’re dealing with a company that focuses on you, the client. All our team members have been fully trained, so that we can provide you with a detailed understanding of awning windows and advise you on the most cost effective and best designed way for you to move forward with your project. We manufacture our products with the highest quality German uPVC profiles. All our products are manufactured to size and we offer installation and replacement services to any home or commercial building. You can expect top of the range products at very competitive prices. We have a range to suit all tastes. Choose from our different styles and colours to find the awning windows and window frames that best suit you. 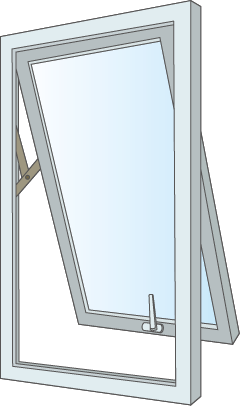 The window closes easily with a user operated handle. Closed position creates a seal that keeps out sound, heat and cold. The handle operates multiple locks and can be deadlocked with the use of a key. The awning window opens outwards. You can push it out as far you want giving you full control of the size of the opening. Due to the use of friction hinges, there is no need to winders, allowing you to open and close the window in one motion. The use of Friction Hinges has many benefits. They assist reliable and accurate closure of your window, create a weather seal and leave the windows completely draught proof. They also counter-balance the weight of the sash, making your window easy to close.